We have once again organized housing options for the Tour of Kansas City race weekend on June 24th and 25th. Park University has extended the deal we worked out for youth racers to all Tour of KC participants. Those looking to save some serious cash can book their stay with Park University. Located just north of Downtown KC in historic Parkville, Missouri, this beautiful campus is an easy drive to both venues. Those staying at Park University will have two options; bring your own linens for $15 per head/per night or they can provide linens for $25 per head/per night. You will choose your option during the room registration process. Per NightWe are not working with a hotel this year. The deals they were offering were not good deals for participants and we found we could find better deals with our own online search. We recommend using online booking tools to find your own hotel. Here is some information about the hotels in the immediate Downtown KC area. We encourage you to book ASAP as rooms are filling up fast due to events in town that weekend. -Walking distance to KC restaurants, entertainment, and nightlife. -Please plan on checking in on Friday no later than midnight. Park University is located just north of Downtown Kansas City, across the river in Parkville, Missouri. *Guests may choose to provide their own linens. XL twin fitted sheet/flat sheet, pillow/pillow case, blankets, bath towels, wash cloths. A sleeping bag would work in lieu of sheets. This will save you $10 per night. You choose your options during the room registration process. Kansas City International Airport (MCI) is only 18 miles from Downtown Kansas City. 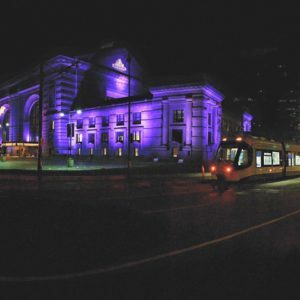 Kansas City’s KC Streetcar runs right near the crit course and is FREE! With a stop just two blocks away, the streetcar will take you to some of KC’s most iconic areas including Downtown, City Market, Union Station, Crown Center, The Kauffman Center for Performing Arts and the KC Crossroads Arts District. For those who wish to ride the streetcar to Sunday’s race, there is a stop just two blocks west of the course start/finish. You can board the streetcar with you bike! Please check the KC Streetcar site for routes and times. The streetcar does not run to Parkville. Kansas City also operates the Metro Area Express rapid transit system (The MAX) that provides shuttle service between Downtown and most of the city’s other favorite attractions, including the River Market, Crossroads Arts District, Union Station and the Liberty Memorial, the Government District, the Nelson-Atkins Museum of Art and the shops of the Country Club Plaza. Of course there are other transit options as well such as Uber and taxis.